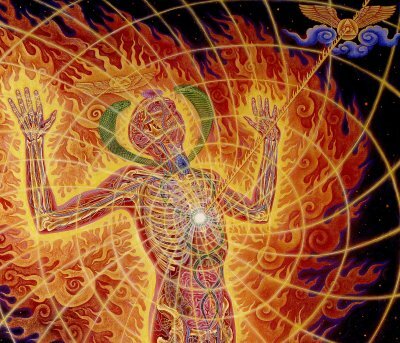 “Holy Fire” by Alex Grey. This is an excerpt from a larger piece. See the complete work http://alexgrey.com/a-gallery/h-fr.html. In my ongoing search for enlightenment, I seek balance through aligning myself to the rhythms of the earth and the natural world around me. The solstices and equinoxes offer me an excellent opportunity to reflect on the cycles of nature and my place within them. By tuning into these rhythms of life, I’m more aware of myself as a piece of nature, subject to my own unique cycles and rhythms. It makes sense to me that my search for harmony and balance must include placing myself in balance with the world around me. I celebrate the summer solstice for its abundance of sunshine and energy. Today’s weather certainly cooperated with that ideal. It was the first real scorcher of summer, and it came right on cue for the summer solstice. I stood outside in the sunshine this afternoon, eyes closed, palms opened toward the light. I bathed in the light, feeling it penetrate my skin, sparkling fragments of light sinking into me and setting each cell of my body alight. My solar plexus glowed with an inner sun that grew brighter with each breath I took. I strained every fiber of my being to embrace the light until I glowed. I limited this sun bath to about five minutes, for although I’m clearly a sun worshipper, I also have huge respect for how swiftly the sun can harm my fair skin. This is part of the reason I pay homage to the sun. We are totally at the mercy of the sun, and utterly dependent upon it as well. There would be no life as we know it without our sun. It is of vital importance to our lives. I try to remember this, but in the day to day bustle of life we sometimes forget fundamental truths, so the summer solstice is the perfect opportunity to remind myself. As I stood in the sun, I imagined myself on fire. (It was about 95 F, so the image came to me easily.) I pictured flames dancing within me. Everything – heart, lungs, muscles, veins, blood – all on fire. I was a forest fire, flames consumed all the dead underbrush of my soul, clearing the way for new ways to grow. I was incandescent. After my sun meditation was over, I decided to commemorate the solstice by blending a new essential oil perfume for the occasion. I wanted it to be fiery. I wanted it to be bright and spicy. I wanted it to support my confidence as I emerge from a long period of uncertainty. I pulled out my oil boxes and got busy. I have over eighty different essential oils to choose from when blending a custom perfume. Diluted into 1 oz. fractionated Coconut oil. Sage is one of the sacred herbs associated with wisdom and longevity, and warding against evil. It is renowned for its spiritual cleansing and purification properties, dispelling negativity and cleansing the aura. Its aroma is herbaceous, sharp, and bright. Hyssop is an invigorating oil, recommended for melancholy and pessimism. Its strong, pungent aroma opens the chest and helps us to face the world, counteracting the urge to withdraw. It can strengthen one’s sense of personal boundaries, and defends the individual from negative influences. It can sharpen awareness and consolidate the aura. Its aroma is sweet, warm, and bright. Holy Basil may aid with anxiety, hysteria and nervous depression. It is a stress reducer without being a sedative. Some sources indicate that, like other basils, it enhances clarity of thought and aid memory retention. It is sweet and spicy in aroma. Clove Bud: This herb has been used in various ways, including protection and purification. This Sun scent can help create a feeling of safe warmth and thus a sanctuary in which to do inner work. Clove’s Elemental Fire aspect encourages action and achievement. This botanical fragrance is good for building confidence and unlocking the chains of old ways of thinking. The oil of clove smells just like the cooking variety, sharp and spicy. Lemon has a clearing, refreshing effect and is particularly useful in the aftermath of emotional storms. It brightens the mood and helps to restore a sense of optimism and good cheer. It smells sweet, bright, and citrusy tart. Ginger root oil is warming and invigorating. It activates will-power, stimulates initiative, and restores determination. In addition, it can help to boost confidence and morale, making it the ideal catalyst of the Will. Invoking and enhancing the vital fire, ginger can restore the exhilaration of achievement. Its aroma is spicy, pungent, warm, sweet and woody. Ylang Ylang has a calming action on the heart. It harmonizes the mind while calming the nervous system. The oil relaxes, uplifts, and helps to reunite our emotional and sensual natures. It soothes and entices, opens and centers us. It allows us to inwardly unify and so outwardly merge. I especially chose the heavy sweetness of ylang ylang to balance the spicy heat of the other oils. The intensely sweet perfume reminds me of tropical flowers that bloom in the heat of midsummer. This blend could carry one less drop of lemon, but an extra drop slipped into the bottle in spite of my plan. I always allow for serendipity in my blends. After blending this oil, I immediately tried it out, even though it can often take a day or several for the oils to fully integrate in a blend. The first scents that are revealed in this blend are the sweet lemony top notes. As it dries down, the spicier notes are revealed. It felt warming and energizing, exactly as I had hoped. It is my intention that this oil blend will help me in situations when I need to feel my connection to the summer sun, shining brightly in my heart.